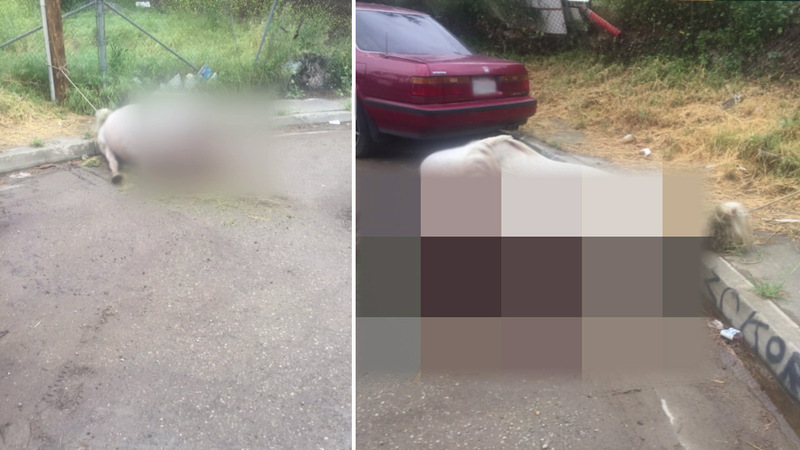 A horse was found possibly beaten and shot to death in Sylmar, Calif., on Saturday, April 9, 2016. LOS ANGELES -- A dead horse was found tied to a telephone pole by its tail in Los Angeles. The horse was found Saturday morning on the 11700 block of Kagel Canyon Street. Police said the horse may have been shot or beaten, or both, but a necropsy will determine the exact cause of death. Investigators hoped to make an arrest in the case soon. "There was tire marks where the horse was left...plus, there was other evidence that was there that will eventually lead to an arrest," said Det. Eric Bixler of the Los Angeles Police Department. Police said it appeared someone tied the horse to the pole to unload it from a trailer or truck. Anyone with information was urged to contact the LAPD Animal Cruelty Task Force at (213) 486-0450.